In conversation with Andy Walker, National Infrastructure Commission chair Sir John Armitt says that the infrastructure sector needs to engage more effectively with the public to get its message across. National Infrastructure Commission (NIC) chair Sir John Armitt is on record as saying that public engagement on infrastructure will be essential to the delivery of future projects. He has described this as one of the biggest challenges for the sector, but one that must be addressed. Given that the public is ultimately one of the country’s biggest investors in infrastructure - whether through taxation, pension fund investment or directly through paying to use the final product - Armitt says that the industry needs to do more to make the public aware of the challenges it faces and the potential options available for development. “The issue is how do you increase the acceptability of projects in a country where there is a guaranteed resistance to almost any project,” said Armitt. “There will always be a group of people who will say “not in my back yard”, but my argument that I have been making for several years to the profession is that if you don’t get out there and talk about it, explain it, be honest with people and show them what choices and options you are having to deal with, ask for their input about what they would be happy with or not and explain to them what the impact of doing nothing is, it’s not surprising that you get this resistance. As long as you have got resistance from the public, you are going to get resistance from the politicians,” he said. Armitt said that it was important to be clear about why infrastructure development is taking place and who was going to benefit from it. “Who are we doing this for at the end of the day? We are not doing this for ourselves we are doing it for the public. The public are the consumers, the users, they are also the payers, so how come they get left out of the loop of debate and consideration?” said Armitt. “So, you need to involve the public and be much more upfront and get them engaged from the beginning. Once you do that then you stand more chance of having a better solution and one that is going to be satisfactory and meet people’s objectives, as well as one that is likely to garner political support because the politicians see that the public are buying into this idea,” he says. Sir John Armitt with Greg Bentley of Bentley Systems at the 2018 Year in Infrastructure conference. Armitt stressed the importance of active and early engagement with local people, often before a route of scheme had even been agreed. “One of the difficult things is when do you start that process?” he said. “High Speed 1 looked at 100 different options, but it looked at them prior and then announced that this is going to be the route. People criticised British Rail at the time for announcing several different route options through Kent, so we had the whole of Kent in uproar, but at the end of a couple of years of going round the villages talking to everyone about the impacts of the different choices, people were keen to see a decision made and that made it easier for government to choose the route,” said Armitt. "You need to involve the public and be much more upfront and get them engaged from the beginning. Once you do that then you stand more chance of having a better solution and one that will meet people's objectives and be more likely to garner political support." As well as early engagement, openness was crucial when talking to local people affected by development, Armitt said. “Project sponsors need to take a lead. They are the people who need to get out there first and start talking and accept that they may be talking not actually with a line on the map even but actually say ‘this is our challenge, we’ve got to get from there to to there but tell us what do you see as being the pros and cons of the different choices,’” he said. “If you are prepared to take people into your confidence at an early stage, not treat them as idiots and ask them to get engaged, that seems to me to be a much more sensible way of going about it,” he said. I asked Armitt if he thought that there was a connection between that type of early involvement (or the lack of it) and taking people into the loop and the reputation that the industry has - some of it deserved, some of it undeserved - amongst the general public as an uncaring sector interested only in itself? “Absolutely. When I was at Costain and we did the Newbury bypass, when we finally got on site the site manager went out knocking on the doors of all the nearest houses and said ‘can we help you in any way’, would it be useful if we came round and washed the windows on a regular basis to offset the impact the project was going to have’”. These things made a big difference. “I was also out at a project a couple of weeks ago where that had been enormous resistance to the development of the old Upper Hayford airfield site. One developer had to sell off that opportunity in 2008 and they had total resistance to everything they were trying to do. The guys who came in immediately went out and started talking to the people about what they are trying to do, why they’d bought the site and listened to what people’s concerns were and so the first thing that they built was a school. “The next thing they did was to take the old warehouses and the buildings there and spruced them up and made them available for small business to start to go into. So, all of a sudden, this horrible housing scheme that was going to be dumped on their doorstep became a place where jobs were being made available and there was a brand-new school and so the reaction of people to that development is now a much more positive one,” Armitt explained. That public desire for consultation is only going to intensify in the age of social media and the internet and this could create a very interesting dynamic in terms of what people want to see for the future and in exercising their right to a say. I asked Armitt how he sees the growing importance of people power in the future in respect of infrastructure development. “There’s a lot more knowledge out there these days and also let’s not forget that much of the funding for infrastructure is the public’s money and it makes them the ultimate stakeholder,” he said. “Government and opinion formers are increasingly recognising this too. The infrastructure we need to give people a better quality of life is one that needs to be paid for and people think that government has the money because it has the ability to borrow, but even when it borrows who’s paying the interest? Who is paying for that borrowing? We are. “We all pay at the end of the day, so all this infrastructure belongs one way or another to the general public and therefore the engagement of them as the ultimate stakeholder in what we are planning to do, why we are intending to do it, what happens if we don’t do it - which I think is a question that very often doesn’t get asked - is vitally important and a lot of politicians are starting to get that,” said Armitt. 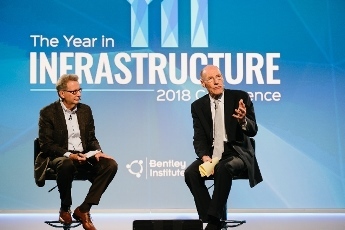 Infrastructure Intelligence editor Andy Walker was speaking to Sir John Armitt at Bentley Systems’ 2018 Year in Infrastructure Conference in London in October.